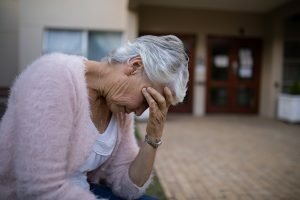 What Signs Can Let You Know Your Senior Is Depressed? Knowing what to look for in your elderly family member’s behavior and activities can help you to spot an episode of depression before it gets out of hand. The sooner you find treatment for your aging adult, the better. Here are a few signs that could signal a problem. She’s Experiencing Much More Pain than Usual. The body reacts to what is happening in the mind, especially for your elderly family member. Even if she has several health conditions already that cause her pain, she might suddenly start experiencing more pain. At first, this increase in pain might seem related to her physical ailments. Quite often, however, pain due to depression does not respond to the solutions that it may respond to from other causes. She’s Having Trouble Making Decisions or Concentrating. Depression really muddles the brain. So your elderly family member may find that it’s suddenly very difficult for her to make even the simplest decisions, like what to have for breakfast every morning. She might also find that it’s difficult for her to concentrate, whether that’s on conversations or even her favorite television show. She might not mention this to you for fear that she’s developing dementia. Clearing the depression can clear her mind. She’s More Irritable than Usual. Dealing with the effects of depression takes a lot of mental and physical energy, even if your aging adult doesn’t realize that she’s depressed. As such, she has a much shorter fuse than she would otherwise have. Being much more irritable than she normally is can give you an indication that depression is the culprit. Her Appetite Has Significantly Changed. Depression has an interesting effect on your elderly family member’s appetite, too. She might find that she can’t eat enough to feel satisfied, especially of certain “comfort foods.” On the other hand, she can also find herself struggling to eat even the tiniest of snacks, because food holds no interest at all for her. if you don’t live with your aging adult, you might want to consider hiring elderly care providers to help her with meal preparation so that she can try to eat normally. If you suspect that your elderly family member is depressed, reach out to her doctor for an assessment right away. Look for ways to help her manage how she’s feeling so that she can get through this trying time. If you or an aging loved one are considering elderly care in Hazlet, NJ, please contact the caring staff at Lares Home Care 888-492-3538 or 732-566-1112.